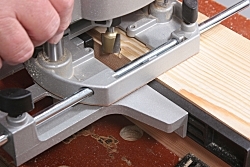 The router should be propelled in the direction usually described as ‘against the rotation of the cutter’. The cutter rotates in a clockwise direction as you look down on it and this means that you’re pushing against the resistance of a cutter that wants to come back to you. At the same time, with clockwise rotation, the cutter is pulling into the wood and trying to move to your left as you push it. This is referred to as ‘cutting into the wood’. The combination of these two factors makes this the correct direction of cut. This is why we put the fence on the right of the router; the cutter pulls the fence against the workpiece and works with us. The same thing applies if we’re using a bearing or a guide bush to position the cut. Strangely, many router manufacturers’ pictures show the router with the fence on the left, even when there’s only one practical way round to hold it. This leads many complete beginners to set up the router as in the manufacturer’s picture and wonder why the cut is difficult.